I took "Girl Desecrated", first-in-series of The Fergus She, which I published on Halloween 2016. I had a little marketing scheme going, which included pre-preparing a 3 second blurb, a 30 second blurb, and offering free tree-of-life bracelets with each sale. I also dropped my novel's price $4 from the Amazon.ca cost, and signed each copy with a quote from the novel. Networking 201: How to “work a room"
So, yes, I could have stayed at my table, but once I got to the Con, I got swept up in the convention excitement. I was having a blast looking at the costumes and chatting with the other vendors. I picked up lots of display tips from the more seasoned authors and writing groups. The table my novel was on was also beside, Nathan Salmon, an artist from the East Coast who had some phenomenal selling skills, and though I didn't take actual notes on those skills, I watched him work the crowd with finesse, and ended up buying a painting for myself. I also spent some time watching the Droids' antics and often wondered who the people were beneath the Star Trooper, Batman, Spider-Man and Desert People costumes. Then, I was off playing in the VR room, which was my first experience with this type of gaming...a mind-blowing experience! And of course, there was a sale at Zacks at the Stone Road Mall across the road, so off I went with my two author Aunties in tow. It’s 1984, Rachel’s 18th birthday, and she’s drinking alone in the Albion, feeling crazy and depressed. What she doesn’t know is a hereditary demon is hatching, the highlanders are coming, and hell’s about to cut loose. But it’s okay, because Rachel’s a bad girl who knows how to party. Try to set up your table beside an active seller who does something, makes something, or shows something that draws a crowd. Or better yet, do something that draws a crowd. (Preferably something legal). Talk to the seasoned vendors, find out where else they show. Exchange cards, learn tips from them. Reach out to all potential customers and build relationships. Leave them with a good feeling and your name. They can always look up you later, online. I'd suggest a QR Code instead of paper. If it ends up in their phone - all the better. If you're going to invest in a banner, stand-up. I found the path of my eyes went from table item to the person, who was usually sitting down. The banners are not effective when in close quarters. Pay for tables at conventions that happen in larges open spaces. This Con was in the Holiday Inn and it was so spread out over so many areas, that the vendors area was just experiencing a trickle (at least when I was there). In contrast, Toronto's Comicon was held in one giant area where all the people circulated, where there was music and panels, and lots of draws. Hook up with a writing group, association or share a table with others. 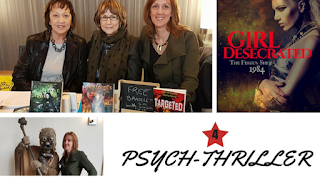 I was lucky enough to share a table with Ryan Toxopeus (Sci-Fi/Fantasy Author), Donna Warner (Crime-Thriller Writer) and award-winning Gloria Ferris (Mystery Author). This defers costs, puts you side-by-side with other authors, allows you to share table-sitting time, and makes for a fun day. I'd love to hear about your convention experiences and other writing/genre cons you think are worth setting up at.